Alex Bowman celebrates in victory lane at Charlotte Motor Speedway after winning the Drive for the Cure 300 on Oct. 7, 2017 (photo courtesy of Getty Images for NASCAR). 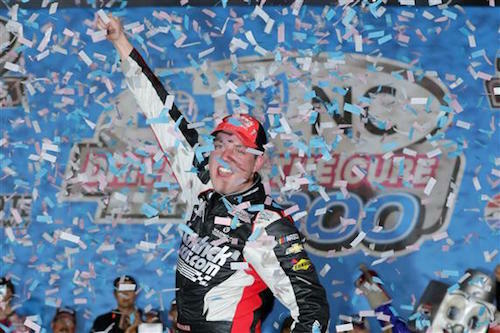 Alex Bowman kicked off his two-race deal with Chip Ganassi Racing with his first-career NASCAR Xfinity Series win Saturday night at Charlotte (N.C.) Motor Speedway. Bowman’s win of the Drive for the Cure 200 was the second win in three races for CGR’s No. 42 team, with both those wins being drivers’ first-time wins, as Tyler Reddick drove the car to victory lane at Kentucky Speedway in Sparta two weeks earlier. Sam Hornish Jr. finished second, Ryan Blaney was third, Austin Dillon fourth and Brennan Poole finished fifth to be the highest-finishing Xfinity Series regular. After start of the race was delayed for over five hours by rain, the playoff field was whittled from 12 to eight drivers with Ryan Reed taking the final advancing playoff spot by a single point over Brendan Gaughan. Gaughan finished the race one position ahead of Reed, just one position outside the top-10, in 11th. The eight drivers who were provisionally in advancing positions before the race were the same eight who officially advanced. Other drivers who didn’t make the cut included Michael Annett, Blake Koch and Jeremy Clements. When the race finally got underway at approximately 8:30 p.m. ET, Daniel Suarez dominated, leading 111 of the 200 laps that made up the race, mostly in the first half. Although he led most of the first half of the race, Erik Jones won the first 45-lap stage after taking the lead from Joe Gibbs Racing teammate, Suarez, on lap 41. Suarez, though, was up front at the end of the second stage that ended at lap 90. Jones wound up with a 30th-place finish after wrecking in the second half of the race. Blaney got out of the pits ahead of Suarez during the sixth caution of the race that came out on lap 121 and ran up front, with Suarez behind him in second, until several drivers, led by William Byron, opted to stay out during the final yellow flag of the race on lap 160. With the benefit of new tires, Bowman moved into the lead soon after the final restart and ran up front the remaining distance. Hornish took second inside the final 20 laps. Justin Allgaier, the points leader heading into the Charlotte race, clinched his second-round playoff spot by being fourth in the running order at the end of the opening stage. He gave up his points lead to Byron, though, as a result of damage to the front-end of his car that led to overheating problems, ultimately ending with a blown engine just past the halfway point of the race. Byron reassumed the points lead with a 16th-place race finish. Finishing sixth through 10th were Cole Custer, Daniel Hemric, Suarez, Matt Tifft and Elliott Sadler. Aside from Allgaier, Reed and Byron, other drivers advancing to round two of the playoffs include Poole, Custer, Hemric, Tifft and Sadler.